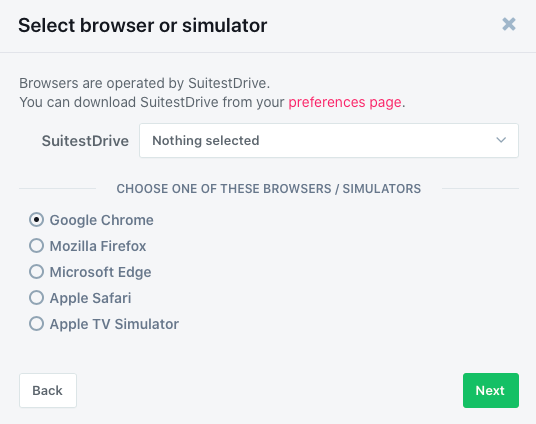 Suitest currently supports Google Chrome, Mozilla Firefox and Microsoft Edge. After you have configured one or more browsers you will be able to run end-to-end tests on desktop websites and web apps. All browsers are operated by SuitestDrive. Before adding a browser to your Suitest account, you need to pair your SuitestDrive with your Suitest organization. In SuitestDrive press Add browser or device. This will open the Add device wizard. After selecting the browser and pressing Next the rest of the process will complete automatically and the browser will become available in your Suitest account. If a particular browser is not installed on your system the corresponding icon will be missing from the device wizard. Install the browser or emulator, restart SuitestDrive and then try adding the device again. To add another browser launch the Device wizard again. It is available from the SuitestDrive's File menu or from within your Suitest account. Now that you have a browser configured, it's time to instrument your app and start testing.